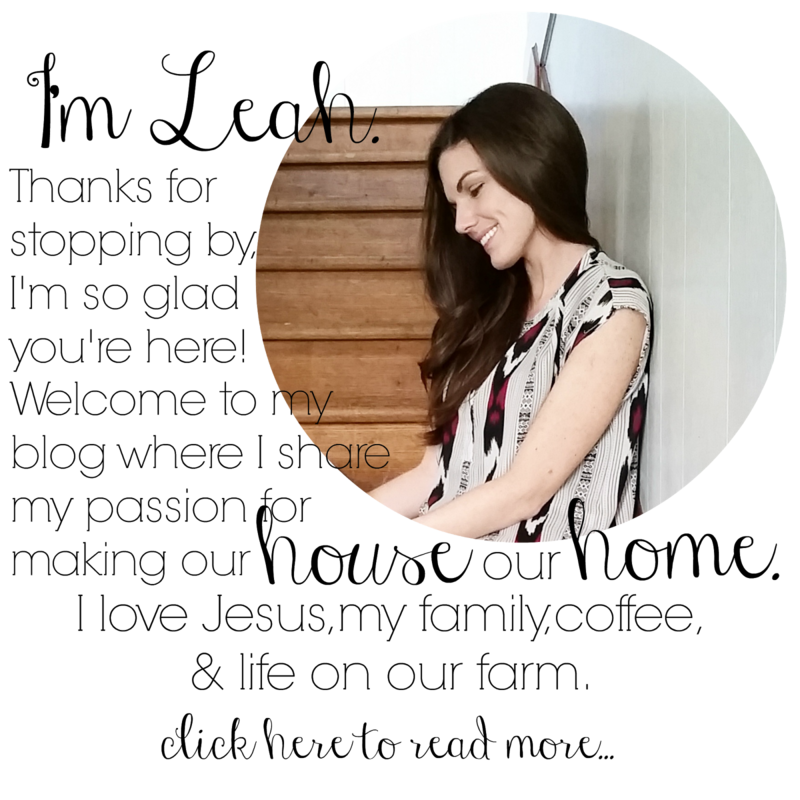 Recently Jen at the blog IHeartOrganizing (which is one of my most absolute favorite blogs!) offered up a cleaning challenge for the month of May. It was just the motivation I needed to whip my laundry room and cleaning storage into shape! Our laundry room is rather small, but it's a room I spend a large amount of time in. Not only does it serve as a place to do laundry, but it also holds all of my cleaning supplies. I like to coral all of my cleaning supplies in one room where I can easily shut the door to keep the little ones out. I like to keep my laundry supplies right on top of the dryer in a basket. It makes it much easier to grab what I need when I'm ready to start laundry for the day. I found a large jar with a lid to hold my dryer sheets and popped on a label to keep it looking organized. I've found that the jar also keeps the dryer sheets nice and fresh. The little blue cup holds any random things I may find while doing laundry such as coins, hair clips, etc. The lamp cozies up the space and puts a smile on my face when I'm doing one of my least favorite chores around the house! The two bins on the shelf hold all of my Swiffer supplies, extra laundry detergent, and extra dryer sheets. 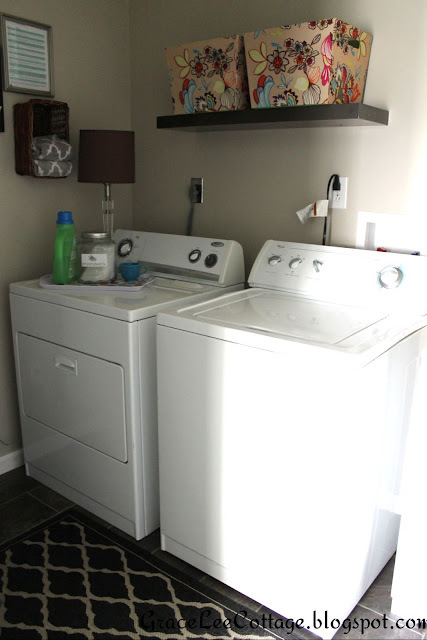 When planning for our laundry room, I made sure we left enough space for a large laundry sink. I can't tell you how happy I am that we made that decision! I use it all the time! The cabinet underneath hold most of my cleaning supplies. I placed the most used items toward the front, such as surface spray, glass cleaner, and wood cleaner. The less commonly used items, such as oven cleaner, bleach, etc. are stored in a basket toward the back of the cabinet. I decided to place all of my bathroom cleaning supplies in one basket that I can easily pick up and carry to the bathroom with me. I keep it fully stocked and ready to go. The basket contains bathroom cleaner, toilet cleaner, rags, a sponge, a magic eraser, paper towels (for cleaning the mirrors and faucets) and an empty grocery bag to line the bathroom trash can. After the bathroom is clean, I re-stock the basket before putting it away. It makes it much easier and less time consuming to tackle cleaning the bathroom the next time around. Aiming to make the most of a tiny space, I used the inside cabinet door surface for storage as well. My cleaning gloves hang on one side with a 3M Command Hook and a clip I found in my office supplies. The opposite cabinet door displays a cork board that holds random cleaning articles that have sparked my interest. The most important part of my cleaning cabinet is the baby proof latch that I keep on the cabinet doors. Even though I try to keep the laundry room door closed, I still want to make sure it's safe when my little helpers are in there with me. On the wall opposite to the washer and dryer I hung hooks to hold my broom, dust pan, Swiffer mop, and Swiffer duster. For major cleaning I use my steam mop, but for small messes I find that it's easier just to use my Swiffer. I tied pieces of ribbon to them to allow for easy hanging. Next up is the wall that holds my ironing board. I found the holder at Walmart for around $7. My mason jar filled with clothes pins fits in perfectly and adds a decorative touch. I found the "Keep Calm and Laundry On" sign at JoAnne's Fabrics a few months ago. Jen framed a stain removal sheet from Martha Stewart's website and placed it in her laundry room. I loved the idea so much, I just had to copy it. 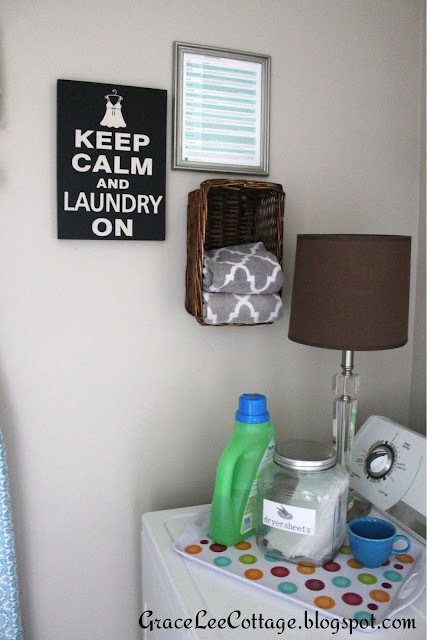 I hung a basket on the wall to hold folded hand towels, so I can replace the one hanging by the sink quickly without having to go to the linen closet in the bathroom to find one. Well that wraps up my laundry room progress as of now. I still have some decorative things I would like to do to make it prettier. :) But for now, I'm loving the new organization, and my new found motivation to get cleaning!!! UPDATE! I finally got a new camera, so I went ahead and captured a couple of new pictures of this space. A few things have been switched around. OH MY Goodness are you amazing!!! Seriously! You have inspired me to get cleaning and to get organized! I need to rethink how I clean and your tips have totally helped me! Pinning!!! I love it! You make cleaning look so much more fun! :) I LOVE those colorful floral baskets too. Wow! 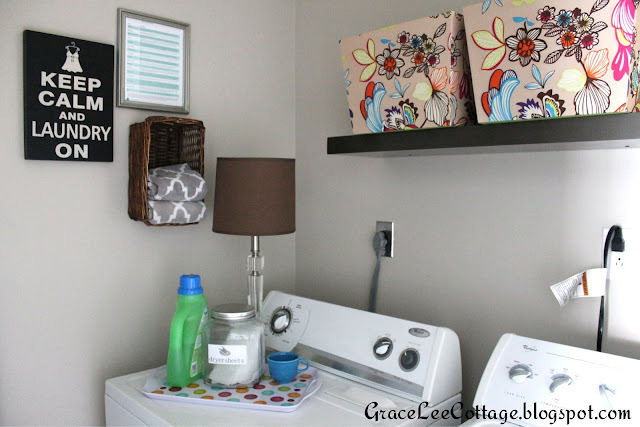 Your laundry room is gorgeous! You did a fabulous job organizing it! I love the rug you chose. I'm visiting from Flaunt It Friday. :) Have a great weekend! Great job...thanks for the decorating inspiration. Thanks to all of you for your kind words! You are really good at organizing! Just like you, I also have separate boxes for my supplies and keep the chemicals hidden in the sink cabinets so that my kids won't reach it and ruin my little space. Haha! It's true that it's fun to do chores if the things that you need are accessible and in proper order. Can anyone recommend how to hang a shark steam mop, its a bit bulky and heavy. I have read your Blog really this is very informative. Thanks for sharing such a useful post.